5-Loxin® is a new, proprietary extract of Boswellia serrata, an Indian tree with long-recognised therapeutic properties. Indeed, its therapeutic applications feature in several traditional pharmacopoeia including Ayurvedic medicine. In Africa and Asia, natural boswellia serrata extracts are traditionally used to relieve inflammatory pain, including that associated with arthritis, rheumatoid arthritis, asthma and certain inflammatory bowel diseases. The benefits of Boswellia serrata come from its exceptional content in boswellic and pentacyclic triterpenic acids, active principles identified as powerful natural anti-inflammatories. Several studies have shown that boswellic acids may be able to combat various processes involved in the inflammatory response. For example, they appear to inhibit the pro-inflammatory enzyme 5-lipoxygenase (5-LOX), as well as pro-inflammatory cytokines and cell adhesion molecules involved in inflammation. With multiple anti-inflammatory properties, boswellic acids thus offer significant potential for relieving the pain of inflammation and treating inflammatory diseases. The anti-inflammatory action of Boswellia serrata has been studied in relation to various therapeutic applications. Scientists have reported analgesic effects, particularly on the joint pain suffered by arthritis patients. Supplementation with boswellic acids has also been investigated for its potential in treating asthma and chronic intestinal diseases such as Crohn’s, while in vitro studies have recently demonstrated a new therapeutic benefit for Boswellia serrata. Boswellic acids appear to inhibit cancerous cell angiogenesis and invasion and thus have an anti-cancer effect. Further studies are also being conducted to evaluate the extent of the potential therapeutic uses of Boswellia serrata. Several Boswellia serrata extracts are now available as nutritional supplements offering the anti-inflammatory effects of boswellic acids. However, they do not all have the same active principle content. The result of many years’ research, the proprietary extract 5-Loxin® has the advantage of being standardised to 30% acetyl-11-keto-beta-boswellic acid (AKBA) and of being free from side-effects. This specific boswellic acid is considered one of the most powerful active principles in Boswellia serrata. To maximise its effects, this new extract is delivered in the form of vegetarian capsules, each containing an optimal 100mg of 5-Loxin®. The suggested dose for this high quality supplement is one to two capsules a day. 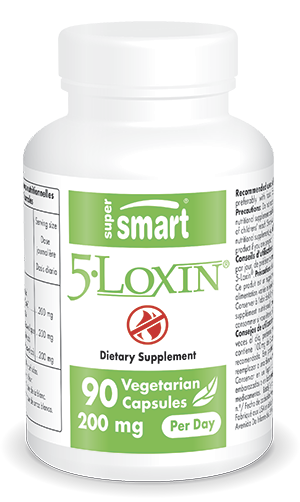 For maximum efficacy, 5-Loxin® should be taken with food. Its effects can be boosted by combining it with other natural anti-inflammatories such as curcumin from turmeric, or luteolin extracted from peanut shells.